One of the main requirements for induction hardening of assembled camshafts (the bearings in this case) is to ensure that the long workpiece can be perfectly clamped, accomplished by using a tailstock for a safe induction hardening process. The MIND-M 1000 hardening machine, designed for workpieces up to 1000 mm in length, can be adjusted to suit almost every requirement for the induction hardening of shafts thanks to its modular design. The induction hardening of the bearings utilizes stationary hardening and a high-frequency generator from eldec. The high frequency prevents deep penetration of the energy into the workpiece and ensures that the shaft is hardened perfectly. The MIND-M 1000 hardening machine is characterized by a high degree of positioning accuracy for induction hardening which is the highest priority in the production of camshafts and other workpieces. The second film shows an application solution for theinduction hardening of cast camshafts. A MIND 750 hardening machine with a shaft transport system and an annealing bar module was used for this purpose. 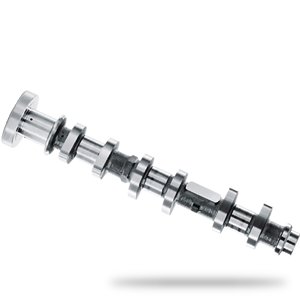 The shaft transport system ensures that the camshaft is held securely to complete the induction hardening process precisely. The modular design of the MIND 750 hardening machine allows the integration of an additional inductor for annealing using an NC-controlled Z infeed into the process in a very simple configuration. Not only is this solution flexible and highly precise using the controlled axis, but is also a very low cost way to integrate annealing processes.